I live very close to the villa and i was impressed when I saw it the first time.It is very warm so you feel like your home ,the stone appropriates to the nature and the green and quiet is is something fantastic . The villa has two comletely bathrooms each in every floor . Each of them has bathtub,toilet ,dryhair machine and there is washimg machine in one of them . Living room with high ceiling and opening window into a pergole covered terrace with view to swimming pool nad garden .The dining room has cable tv / satellite tv, dvd player, stereo, Large sofa (twinbed),fireplace, internet and WI-FI , handmade crafts). The villa is suitable for families with kids, elders, people with moving problems, marriages and honeymmon. We booked this villa a year in advance as part of a special celebration-and how special it was !! We were greeted upon arrival by the beautiful Alexandra and given a real cretian welcome as she gave us a lamb and pasta dish and home made Raki. The villa was fantastic, the pictures don't do it enough justice-the pool is clean and the rest of the villa immaculate. All rooms have aircon and Alexandra has thought of everything from beach towels through to electric mosquito repellants in all the bedrooms. We would wake in the morning and watch the birds of prey and other wildlife. You need a car to visit the beaches but otherwise all amenities are within walking distance-a good butcher, a lovely supermarket (ask for home made raki !) and three outstanding tavernas-check trip advisor for the tavernas in Prines-all of them giving a warm welcome and lovely food. Alexandra is on hand nearby should you need anything but doesn't intrude -she left several wonderful home made jams,deliscious cheese pies and lemon cordial to die for ! We will return -words cannot fully explain how nice the whole experience was-Thankyou from us all. The house is large, well appointed, with beautiful flowers and a pool. It is located in a charming village above Rethymno. It would be best to have a car to stay there. The best part is the lovely Alexandra. She is so kind and helpful, plus she gave us some delicious food treats. I would stay for a month or a year if i could! We just wanted to say thank you for a great holiday at your villa. You’d thought of everything and we really appreciated your effort and the gifts. The villa was perfect for us. We had everything we needed, the house was immaculate and well equipped, the wifi worked great, AC in every room, the pool was refreshing and fun. This lovely villa is exactly as shown in the photographs and Alexandra was the perfect hostess. Alexandra's genuine concern that our party of 4 had a good holiday extended to having a delicious lunch ready for us on arrival and at the end of a long journey we were all very grateful. The bottle of Raki left for us by Alexandra was also very welcome. The villa is beautifully appointed and lacks for nothing, there were only 4 of us but the villa could easily house more. 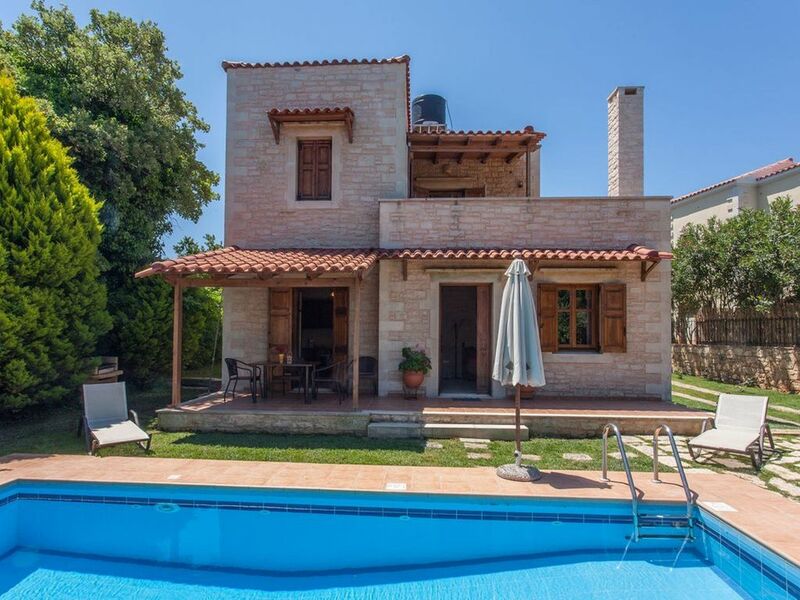 The villa is situated in a quiet position on the edge of a village but within easy reach of Rethymno and perfectly placed to tour a large part of the island. I can confidently recommend the villa and am most grateful for Alexandra's kindness during our stay and would love to return. We have just spent a wonderful 2 weeks in Crete, staying in the lovely house belonging to Alexandra. On arrival we were greeted by Alexandra, a kinder, more welcoming host you couldn't wish to meet. Alexandra had made us a delicious lamb and pasta dish to have on our arrival and during the course of our stay, popped in with more Cretan treats. The house is beautifully decorated and has everything you could possibly need for your stay. There are lovely views of the sea from the balcony, that both upstairs bedrooms open out onto. Sitting in the garden by the pool you could smell the jasmine and throughout the beautiful village of Prines the lovely smell of figs. Prines is a very pretty village with a couple of very good tavernas within walking distance. The next village down the hill also has a couple of very good tavernas, a wonderful bakers and coffee shop, as well as a few other shops and bars. We were amazed at the kindness and generosity of the Cretan people and are already counting down to our return visit to Alexandra's house next summer. We had a great holiday, enjoying Crete and relaxing in the lovely Villa Phaedra. Alexandra greeted us with warm pastries and a carafe of Raki, both delicious and very welcome. When she came to check all was well later in the week she arrived with a tasty lemon cake and home made cordial, which everyone loved. The Villa has a balcony with great views, perfect for breakfast or an evening meal and the pool was great. What really made the holday special though was the warm welcome and friendliness of Alexandra - we hope to see you again very soon! Sandy beach is only 2 km away. Distance from the village center is 300 m and from Rethymno city is 5 km. Prines village has many tavernas with traditional local food , mini-market, coffe shops.